The streets surrounding you seem packed full of people, they’re tired, desperate for even a sliver of change. Their government has turned it’s back upon the people, so they’ve taken to the streets. Adults and children have become malnourished, forced to eat out of trashcans to survive another grueling day. The people of Venezuela have few options left, so many have abandoned their country and homes out of pure desperation. Despite this, the government and those who support them continue to neglect the people of Venezuela. Currently, Venezuela is in the midst of a crisis, with people starving and desperate for help. The man currently in charge is Nicolás Maduro, the president of Venezuela. However, many have protested his rule and actions since taking his second term. Maduro jailed much of his opposition, ensured that a new legislative body created to rewrite the constitution. Following Maduro’s re-election, jury-rigging was widely reported by many. Currently, the country is in the midst of a humanitarian and financial crisis. Prices have skyrocketed in the country, with the inflation rate expected to reach 10 million percent in 2019. For the citizens of Venezuela, food shortages have reached an all-time high. The majority of the country is unable to access food, children becoming severely malnourished. When trucks containing food arrived at the border, militias prevented them from entering. These militias that supported Maduro would eventually set the trucks on fire. He is not allowing any humanitarian aid to enter the country, denying that a crisis exists. Thousands have taken to the streets to protest Maduro and his rule, many becoming injured as a result. Recently, a man named Juan Guaidó has sworn himself in as interim president, with the United States and Canada almost immediately backing him. 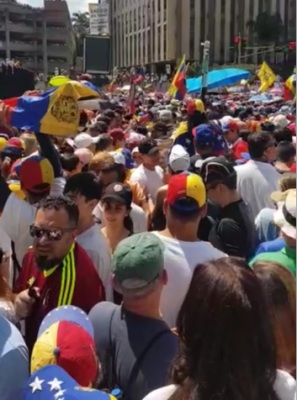 Many Venezuelans have taken to the streets to support him, with many Latin American countries now recognizing him as head of state. While this crisis may seem miles away for many students at Klein Cain, for some, this is right at their doorstep. Some students at the school have family who fled the country or are currently unable to leave. For them, this crisis is not just another civil war millions of miles away, but a real issue that affects their day to day life. For ThomasFerrando, she feels fear for her grandfather and aunt, who have not left the country yet. Her grandfather refuses to abandon the life he had built, his home, and his company. Despite the difficulties, he wants to stay, while her aunt remains to take care of him. He, like many others, does not want to abandon his country, hoping for change. Despite this hope, he still faces corruption in his daily life while trying to work. Food is something that is always an unknown, with shelves often empty and barren. With inflation and the economic crisis, it is borderline impossible to buy food. ThomasFerrando’s aunt and uncle have described people digging through trash cans, desperate for anything they can eat. This desperation is not just a few people, but an issue found all throughout the country. Recently Maduro had journalists detained from the country after they showed him film of young Venezuelans eating out of a garbage truck. For the people in Venezuela, every day becomes another battle to be fought. With the current political and economic crisis, basic supplies sell for high prices. On a surface level, nothing seems to be changing soon. Some of the people barely have enough food to avoid starvation, while others are already starving. Stores and hospitals don’t have enough supplies for everyone, with shelves emptied out in alarming numbers. With the crisis growing bigger and bigger, many Venezuelans wonder when this crisis will come to an end. The people are starving, hospitals are running out of supplies, and the citizens are desperate for change. With food, basic toiletries, and medicine in such high demand, and such low supply, it is understandable. Soldiers have abandoned some of their posts, while others remain loyal. While it seems that Juan Guaidó will take over after Maduro, nothing seems certain in times such as these. For the students at Klein Cain with family in Venezuela, they can only hope for the best.